The spotlight is shining brightly of late on the hidden value of organizational health and how to capture it. Even all the way to Washington, D.C. Apparently that’s not so when it comes to the U.S. Veterans Health Administration (VHA). Consider the recent scandal that came to a head late last month when President Barack Obama ordered a White House investigation in regard to U.S. Armed Forces veterans dying while waiting for care at the VHA facility in Phoenix and others across the country. The investigation identified “significant and chronic system failures” and a “corrosive culture” inside the VHA, as widely reported by major news media outlets. April 30: CNN reported that at least 40 U.S. Armed Forces veterans died while waiting for care at the VHA facilities in Phoenix. June 5: VHA internal investigations had identified a total of 35 veterans who had died while waiting for care in the Phoenix VHA system. May 16: The VHA’s top health official retired early at the request of the Secretary of Veterans Affairs (VA). May 30: That same Secretary resigned from office amid the fallout from the controversy. Early June: Several other VA medical centers around the nation have been identified with the same problems as the Phoenix facility. The investigations widened. June 9: An internal VA audit found that more than 120,000 veterans were left waiting or never got care. Pressures were placed on schedulers to use unofficial lists or engage in inappropriate practices to make waiting times appear more favorable. June 11: The Federal Bureau of Investigation opened a criminal investigation of the VA. There you have it: The epitome of an unhealthy organization. That’s a far cry from the days when Stewart Liff held many high-level positions throughout his federal career. The office in LA ended up getting the OPM Director’s PILLAR (Performance Incentives Leadership Linked to Achieving Results) Award. Now that’s a healthy outcome. So, the real question becomes: How do you create and sustain organizational health in the government? However, there is another, more exciting and self-sustaining approach that uses characteristics of all the above practices. It’s accomplished by building teams of leaders within government agencies. Such an approach starts with the generally accepted premise that high-performing teams out-perform groups of individuals. By building teams of leaders, without an official team leader to oversee the team, you elevate the teams to the highest possible level. The reason for this occurrence is because everyone within the team provides leadership. Each member is responsible and accountable for the team’s performance, understands the value he or she contributes, and is well developed. Collectively, this results in an unprecedented degree of employee engagement and commitment. Meanwhile, the official team leader is now free to focus on other higher-level work. Why? Well, the team can now handle the tasks that were previously performed by the team leader. that are used in all four organizational approaches. That is why A Team of Leaders approach is so powerful. 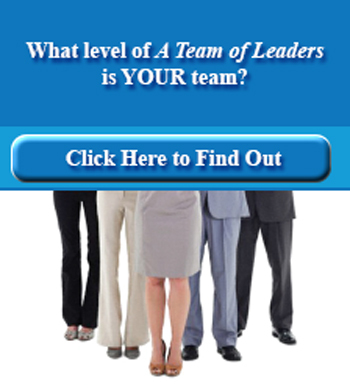 A team of leaders is what we refer to as a Stage Five Team in the application of the Five-Stage Team Development Model. To get to that level, teams that desire to become teams of leaders evolve through careful planning from a traditional Stage One Team. This is accomplished through a series of distinct phases until they eventually become a Stage Five Team of Leaders. Below is an illustration showing the changing roles of an evolving team. The red dot represents the role of the supervisor; the blue dot the team members; and the green dot the members once they assume leadership responsibilities. The supervisor’s leadership role slowly shifts until he or she becomes an advisor. Meanwhile, the members evolve from being followers to becoming leaders. That is the ultimate objective as the team produces its best results at Stage Five. This design is being used in many industries with great success. It produces outstanding results. For example, organizations we’ve worked with that have adopted this approach have saved hundreds of millions of dollars. They have become high-performing football teams (read about BYU here). They have even received performance awards from the Vice President of the United States. Transforming a traditional team into a Stage Five Team is hard work. It requires time, energy, commitment, support and planning. Basically, you need to nurture the team’s development. Below are the key elements of a successful redesign effort. Note that each element must fit together so there is balance and focus. The Five-Stage Team Development Model: You use it as a framework to guide your thinking as the teams evolve. You Get What You Design For: You create the proper design by analyzing your environment, processes and culture. Team Processes: Your teams need processes that support teams of leaders, such as core processes, on-boarding, off-boarding, etc. Value Creation Model: Your teams’ members need to know how much value they create. Knowledge Management: You must manage the knowledge required to build teams of leaders. Visual Management: Your teams’ physical plant should reinforce all other design elements. Building teams of leaders is not easy. But, the return on investment will be more than worth your time and energy. And it will help keep your organization healthy, unlike the VHA and VA before its scandal was exposed. It’s time to dig deeper into what it takes to make this transformation happen and help get your business on the path to success. It’s right at your fingertips. 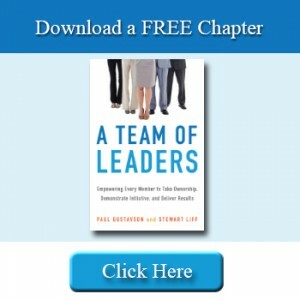 Go now to download a free chapter from our book A Team of Leaders: Empowering Every Member to Take Ownership, Demonstrate Initiative, and Deliver Results.